Livingston, Chip. “CROW-BLUE, CROW-BLACK” NYQ Books, 2012. I fell in love with Chip Livingston’s poetry when I read his first collection, “Museum of False Starts” and in fact, it sits in a prominent place on my desk. 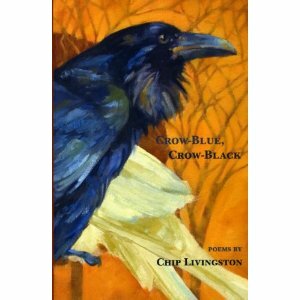 Therefore it was only natural that I would be anxious to read his second collection, “CROW-BLUE, CROW-BLACK”. Somehow I feel that the verb “read” is not the word I am looking for—perhaps I should have said “savor” or “taste” since Livingston’s poetry appeals to all of the senses and to read it is to only see it from one point of view. Rather I let it embrace me and carry me away. Livingston writes about finding his identity. He was raised in the South and is gay but he moved to New York where he was quickly immersed into a different scene then he was used to. He tried to find his place but soon left and went to Uruguay where he found love with a man from Argentina. As I read I was amazed at how the poems swept me in and I realized that I had also been “there”. We search for who we are and when we think we have found out, the search continues. We are influenced by where we live and who we meet and just as the poet here is influenced by the Uruguayan landscape, he was influenced by his time in Greenwich Village and it was the experiences of the Village that pushed him further south. The poetry here is not only a road map of Livingston’s search for himself but of the Americas as well. As we read we find that we are pulled into the incantations that he gives us as he combines the narratives unique to native Americans with the lyricism of the poets of the New School and in doing so, we get something completely different. The poetry enters both mind and body and we feel it. What I love about poetry is like what Forest Gump had to say about a box of chocolates. We never know how it will affect us or if it will. I cannot remain unaffected by Livingstone’s poetry because it hits home so hard. He does not hold back and says what he feels as he looks through the keyhole of life. Every line is important and every word is hand-picked. It is through the poems that we see the poet’s life as well as our own and sometimes it is brutal, other times it is beautiful and it is always lyrical and honest. I do not profess to be an expert on poetry but I am an expert about what I like and I love these poems. Usually when I review poetry, I include examples of what I am talking about but here I choose not to because I want everyone to have an equal chance at enjoying Livingston’s poems—or maybe I just don’t want to share publicly. If the poems appeal to me on a personal level, than I can guess that they will also appeal to many others. I chide you to find out for yourself. This entry was posted in GLBT poetry on June 13, 2012 by Amos.